Regular physical exercises are perfect for growing the muscle mass and weight loss. If you want to speed up the weight loss process and improve both physical and emotional health, you should eat properly. Perhaps there is no such a person in the world, who has not heard that food affects the body weight. Dietary foods reduce fat deposits, while high-calorie foods provoke the formation of body fat and create conditions for overweight or obesity. Many people are unaware what and how much weight loss foods they should eat per day. Some say – meat is bad for people and they reduce the amount of meat in the diet but still fail to lose any weight. Others say that you need to eat any kind but healthy foods. This review of weight loss foods will help you to choose what suits you best. In order to lose weight and make your figure more attractive, there is just one rule – the amount of calories you consume must be smaller than the amount of calories you burn. After your body weight becomes normal, the number of consumed and burned calories should be equal. Every obese person should start his or her day with breakfast. Nutritionists believe that a wholesome breakfast normalizes work of the gastrointestinal tract and provides your body with energy. But the most important thing is that weight loss foods for breakfast can improve and accelerate your metabolism. If you have no breakfast in the morning, then you will feel irritation and weakness after a while. This happens because the level of glucose (nutrient for brain) is reduced. The work of the brain deteriorates, it sends signals to release glucose from liver and muscles, and due to this the muscles get weaker. You can change the recipes of weight loss foods for breakfast several times a week. Pay particular attention to cottage cheese, yogurt and other soured dairy products. Such foods contain essential and nonessential amino acids, without which the body cannot function properly. 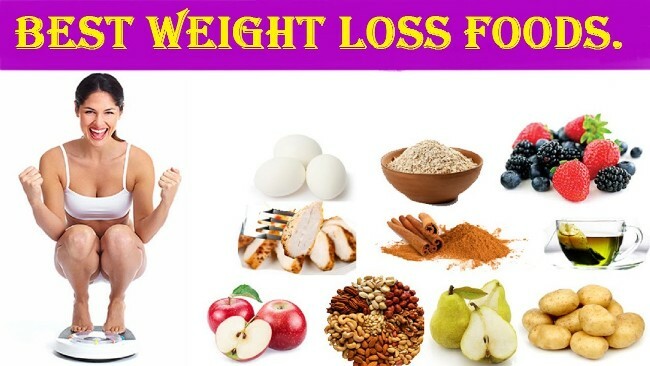 Low-calorie weight loss foods high in calcium are good for a normal metabolism, for keeping your teeth strong, improving the nervous system, as well as for secretion of some enzymes and hormones. The most important thing is that the energy from breakfast lasted until lunchtime. The list of best weight loss foods for lunch must include products high in carbs and proteins. Special attention should be paid to the method of cooking. Surprisingly, but the same foods can be more or less healthy and useful when cooked differently. Natural weight loss foods for lunch must contain healthy fats (for example, Omega-3 and Omega-6). Unsaturated fatty acids reduce the fat deposits, increasing the immunity, reducing the cardiovascular diseases and providing positive effect on health. Best time for lunch is between 12 and 3 p.m. In addition to main meal, weight loss foods may contain soups, salads and juices. Most weight loss diets suggest small but frequent meals, so it is recommended to have second lunch before dinner. Dinner must be the latest main meal before sleep and it must not overload the gastrointestinal tract work at night. The list of weight loss foods and drinks for dinner may contain almost any products, consumed during the day, but in smaller amount and with some exclusions. In the evening, make sure you don’t consume a large amount of simple and complex carbohydrates. The thing is that energy is almost not consumed at night and its excess turns into fat. Thus, sweet carbonated drinks should be removed from your daily diet. The best food for dinner is versatile foods, but it should compensate the necessary supply of vitamins, minerals and other microelements wasted during the day. Weight loss foods for kids and elderly occupy a special place. This category of people needs to take care of bones, internal organs and tissues of skeletal muscles. You can cook dinner on your own or order some weight loss foods with home delivery. Many restaurants offer to buy weight loss foods that taste good. Healthy eating industry is growing every year and more companies propose high quality but cheap foods that can meet the needs of the most picky eaters. The list of weight loss foods includes healthy food that can be used other than for weight loss as well. Once you achieve your desired weight loss, healthy food helps to keep a stable weight. No wonder diets are recommended for all people suffering from overweight or obesity. Healthy foods allow to avoid destructive consequences on your body, waist and skin. Try versatile weight loss foods and you will find one that suits you best. Once feared for being high in cholesterol, whole eggs have been making a comeback. New studies show that they don’t adversely affect blood cholesterol and don’t cause heart attacks. What’s more… they are among the best foods you can eat if you need to lose weight. They’re high in protein, healthy fats, and can make you feel full with a very low amount of calories. One study of 30 overweight women showed that eating eggs for breakfast, instead of bagels, increased satiety and made them eat less for the next 36 hours. Another 8 week study found that eggs for breakfast increased weight loss on a calorie restricted diet compared to bagels. Leafy greens include kale, spinach, collards, swiss chards and a few others. They have several properties that make them perfect for a weight loss diet. They are low in both calories and carbohydrates, but loaded with fiber. Eating leafy greens is a great way to increase the volume of your meals, without increasing the calories. Numerous studies show that meals and diets with a low energy density make people eat fewer calories overall. Oily fish like salmon is incredibly healthy. It is also very satisfying, keeping you full for many hours with relatively few calories. Salmon is loaded with high quality protein, healthy fats and also contains all sorts of important nutrients. Fish, and seafood in general, supplies a significant amount of iodine. This nutrient is necessary for proper function of the thyroid, which is important to keep the metabolism running optimally. Studies show that a huge number of people in the world aren’t getting all the iodine they need. Salmon is also loaded with Omega-3 fatty acids, which have been shown to help reduce inflammation, which is known to play a major role in obesity and metabolic disease. Mackerel, trout, sardines, herring and other types of oily fish are also excellent. Cruciferous vegetables include broccoli, cauliflower, cabbage and brussels sprouts. Like other vegetables, they are high in fiber and tend to be incredibly fulfilling. What’s more… these types of veggies also tend to contain decent amounts of protein. They’re not as high in protein as animal foods or legumes, but they’re high compared to most vegetables. Meat has been unfairly demonized. It has been blamed for all sorts of health problems, despite no good evidence to back it up. Although processed meat is unhealthy, studies show that unprocessed red meat does NOT raise the risk of heart disease or diabetes. According to two big review studies, red meat has only a very weak correlation with cancer in men, and no correlation at all in women. The truth is… meat is a weight loss friendly food, because it’s high in protein. Protein is the most fulfilling nutrient, by far, and eating a high protein diet can make you burn up to 80 to 100 more calories per day. Studies have shown that increasing your protein intake to 25-30% of calories can cut cravings by 60%, reduce desire for late-night snacking by half, and cause weight loss of almost a pound per week… just by addingprotein to the diet. White potatoes seem to have fallen out of favour for some reason. However… they have several properties that make them a perfect food, both for weight loss and optimal health. They contain an incredibly diverse range of nutrients, a little bit of almost everything we need. There have even been accounts of people living on nothing but potatoes alone for extended periods of time. They are particularly high in potassium, a nutrient that most people don’t get enough of and plays an important role in blood pressure control. On a scale called the Satiety Index, that measures how fulfilling different foods are, white, boiled potatoes scored the highest of all the foods tested. What this means is that by eating white, boiled potatoes, you will naturally feel full and eat less of other foods instead. If you boil the potatoes, then allow them to cool for a while, then they will form large amounts of resistant starch, a fiber-like substance that has been shown to have all sorts of health benefits… including weight loss. Sweet potatoes, turnips and other root vegetables are also excellent. Tuna is another low-calorie, high protein food. It is lean fish… so there isn’t much fat in it. Tuna is popular among bodybuilders and fitness models who are on a cut, because it’s a great way to keep protein high, with total calories and fat low. Some beans and legumes can be beneficial for weight loss. This includes lentils, black beans, kidney beans and some others. These foods tend to be high in protein and fiber, which are two nutrients that have been shown to lead to satiety. They also tend to contain some resistant starch. As mentioned above, meals and diets with a low energy density tend to make people eat fewer calories. Most foods with a low energy density are those that contain lots of water, such as vegetables and fruits. But you can also just add water to your food… by making a soup. Dairy products tend to be high in protein. One of the best ones is cottage cheese… calorie for calorie, it is mostly just protein with very little carbohydrate and fat. Eating plenty of cottage cheese is a great way to boost your protein intake. It is also very satiating, making you feel full with a relatively low amount of calories. Avocados are a unique type of fruit. Whereas most fruit is high in carbs, avocados are loaded with healthy fats. They are particularly high in monounsaturated oleic acid, the same type of fat found in olive oil. Despite being mostly fat, they also contain a lot of water, so they aren’t as energy dense as you may think. Avocados are perfect as additions to salad, because studies show that the fats in them can increase the nutrient uptake from the vegetables 2.6 to 15-fold. Apple cider vinegar is incredibly popular in the natural health community. It is popular for use in condiments, like dressings or vinaigrettes. Some people even dilute it in water and drink it. Several studies in humans suggest that vinegar can be useful for weight loss. Taking vinegar at the same time as a high-carb meal can increase feelings of fullness and make people eat 200-275 fewer calories for the rest of the day. One study in obese individuals also showed that 15 or 30 mL of vinegar per day for 12 weeks caused weight loss of 2.6-3.7 pounds, or 1.2-1.7 kilograms. Despite being high in fat, nuts are not inherently fattening. They’re an excellent snack, containing balanced amounts of protein, fiber and healthy fats. Studies have shown that eating nuts can improve metabolic health and even cause weight loss. Population studies have also shown that people who eat nuts tend to be healthier, and leaner, than the people who don’t. Just make sure not to go overboard, as they are still pretty high in calories. If you tend to binge and eat massive amounts of nuts, then it may be best to avoid them. Despite grains having gotten a bad rap in recent years, there are some types that are definitely healthy. This includes some whole grains that are loaded with fiber and contain a decent amount of protein as well. Notable examples include oats, brown rice and quinoa. Oats are loaded with beta-glucans, soluble fibers that have been shown to increase satiety and improve metabolic health. Rice, both brown and white, can also contain significant amounts of resistant starch, especially if cooked and then allowed to cool afterwards. Keep in mind that refined grains are a disaster, and sometimes foods that have “whole grains” on the label are highly processed junk foods that are both harmful and fattening. Eating chili peppers may be useful on a weight loss diet. They contain a substance called capsaicin, which has been shown to help reduce appetite and increase fat burning in some studies. This substance is even sold in supplement form and is a common ingredient in many commercial weight loss supplements. One study showed that eating 1 gram of red chilli pepper reduced appetite and increased fat burning in people who didn’t regularly eat peppers. However, there was no effect in people who were accustomed to eating spicy food, indicating that some sort of tolerance can build up. Most health experts agree that fruit is healthy. Numerous population studies have shown that people who eat the most fruit (and vegetables) tend to be healthier than people who don’t. Of course… correlation does not equal causation, so those studies don’t prove anything, but fruit do have properties that make them weight loss friendly. Even though they contain sugar, they have a low energy density and take a while to chew. Plus, the fiber helps prevent the sugar from being released too quickly into the bloodstream. The only people who may want to avoid or minimize fruit are those who are on a very low-carb, ketogenic diet, or have some sort of intolerance to fructose. One fruit that deserves to be highlighted is grapefruit, because its effects on weight control have been studied directly. In a study of 91 obese individuals, eating half a fresh grapefruit before meals caused weight loss of 3.5 pounds (1.6 kg) over a period of 12 weeks. The grapefruit group also had reductions in insulin resistance, a metabolic abnormality that is implicated in various chronic diseases. Chia seeds are among the most nutritious foods on the planet. They do contain 12 grams of carbohydrate per ounce, which is pretty high, but 11 of those grams are fiber. This makes chia seeds a low-carb friendly food, and one of the best sources of fiber in the world. Because of all the fiber, chia seeds can absorb up to 11-12 times their weight in water, turning gel-like and expanding in your stomach. Although some studies have shown that chia seeds can help reduce appetite, they have not found a statistically significant effect on weight loss. However, given their nutrient composition, it makes sense that chia seeds could be a useful part of a weight loss diet. Coconut oil is high in fatty acids of a medium length, called Medium Chain Triglycerides (MCTs). These fatty acids have been shown to boost satiety compared to other fats, as well as increase the amount of calories burned. There are also two studies, one in women and the other in men, showing that coconut oil led to reduced amounts of belly fat. Of course… coconut oil still contains calories, so adding it on top of what you’re already eating is a bad idea. So this is not about adding coconut oil to your diet, it is about replacingsome of your other cooking fats with coconut oil. Extra virgin olive oil is also worth mentioning here, because it is probably the healthiest fat on the planet. Another excellent dairy food is yoghurt. Yoghurt contains probiotic bacteria that can improve the function of your gut. Having a healthy gut may potentially help protect against inflammation and leptin resistance, which is the main hormonal driver of obesity. Just make sure to choose full-fat yoghurt… studies show that full-fat dairy, but not low-fat, is associated with a reduced risk of obesity and type 2 diabetes over time. Low-fat yoghurt is usually loaded with sugar, so it is best to avoid that stuff like the plague.